Help us improve the SAADA user experience! Do you want to help SAADA grow? Do you have suggestions for how we can better serve you? Please help us improve the SAADA user experience for our community by completing this short survey. You can make a difference! Last weekend I had the privilege of delivering a keynote address at the 12th annual SAAN undergraduate student conference at the University of Michigan in Ann Arbor. SAAN (South Asian Awareness Network) aims to increase awareness of issues salient to South Asian communities, encourage its participants to engage thoughtfully with their surroundings and promote innovative solutions to issues of social justice. It is one of the largest undergraduate South Asian American student conference in the country. 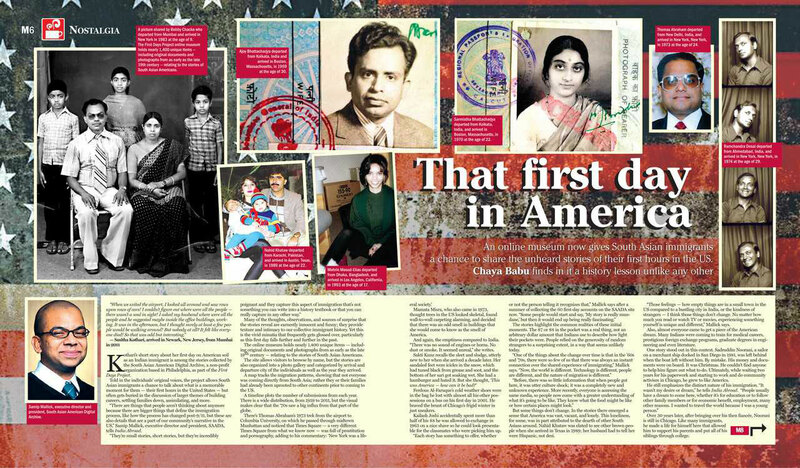 We started SAADA in 2008 because we recognized that stories from South Asian American communities were in danger of being forgotten by history. Today, our freely-accessible digital archive contains nearly 1,500 items reflecting the diversity of South Asian American experiences. Back in 2008, we could never have imagined that we would come this far. Check out this week's issue of India Abroad Magazine (October 25, 2013) for a feature article on SAADA's First Days Project! On October 3, I had the honor of doing a presentation sharing materials from SAADA at the residence of Indian Ambassador Nirupama Rao. The event was to commemorate the 144th Birth Anniversary of Mahatma Gandhi and also featured a performance by Grammy-nominated artist, Chandrika Tandon. See more photos from the event: here.